Sand Beach… a pretty little beach located in the Newport Cove. The proximity of steep rocky cliffs to perfect white sand, makes this beach so picturesque. And the water… I’ve seen such blue waters only in the Caribbean. The Park Loop Road runs parallel to the shoreline. As you climb along the rocky pathway going up from Sand Beach, you get an awesome view with cliffs rising right off the churning ocean waters. Lots of comfortable rocks to sit on and enjoy the view. Further along the coast, off the park Loops Road, is Thunder Hole. It is an extremely narrow cove between high cliffs which makes a sound like thunder when a wave rolls into it. 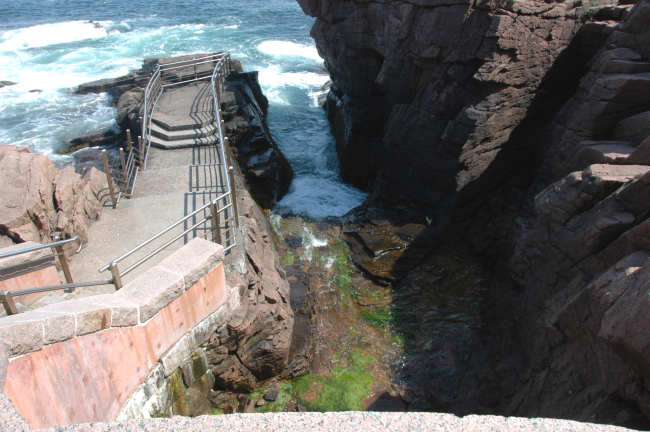 The noise is produced because of a cavern below the surface of the water in the cove. The way the water bursts up in high sprays as tall as 40 feet is striking. 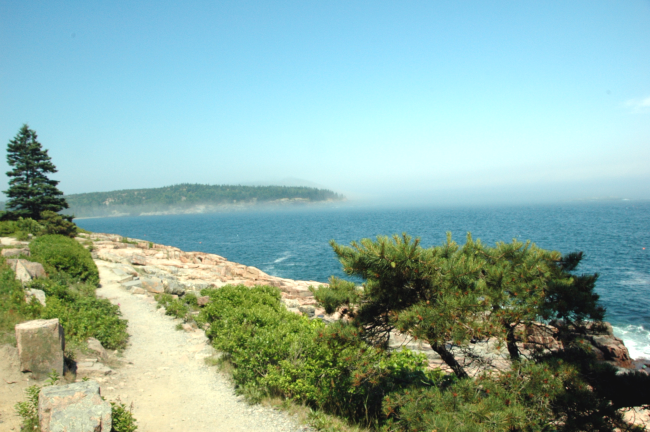 Cadillac Mountain is named after French explorer and adventurer, Antoine Laumet de La Mothe, sieur de Cadillac. Mount Desert Island, the territory where Cadillac Mountain is located, was part of New France, the area colonized by France in North America, between 1534 and 1763. 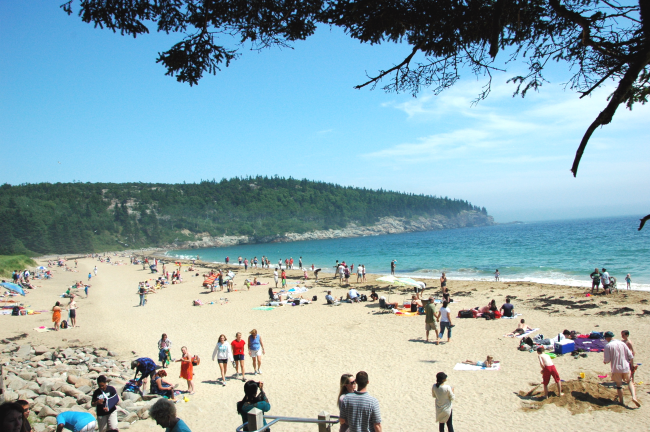 De Cadillac received the land grant for Mount Desert Island from the Governor of New France in 1688. Before being renamed in 1918, the mountain was called Green Mountain. 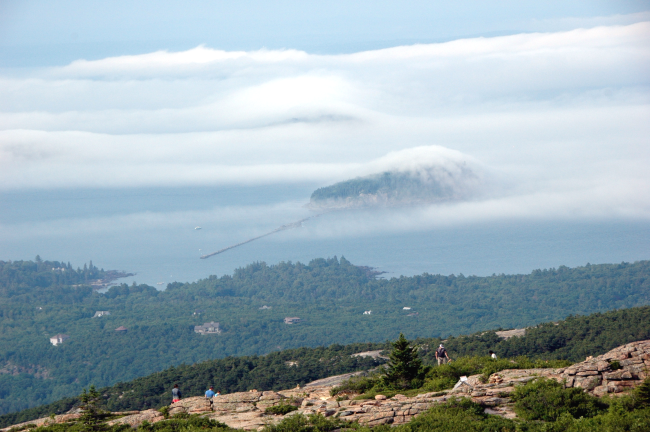 Topping at 1,530 feet, Cadillac Mountain is the tallest mountain along the eastern coast of the United States. The views from the summit of Cadillac Mountain is awesome to say the least. You see far off mountains and islands shrouded in mist, giving them a aura of mystery. Really worth spending some time at the top. 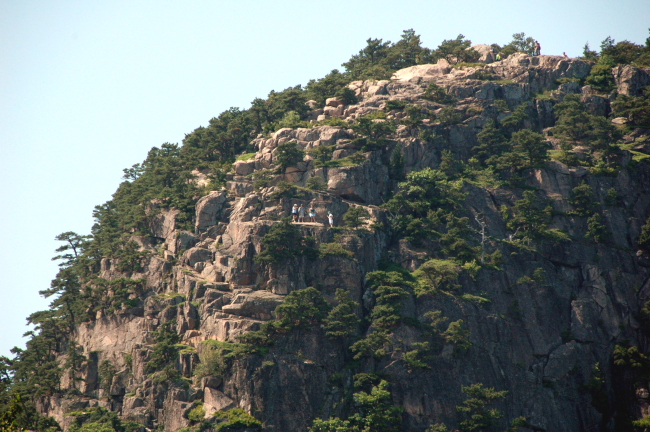 During the fall and winter, many tourists go to the mountain summit to see the nation’s first sunrise. There used to be a cog railway running up the mountain, from 1883 until 1893. Guess where it was moved in 1895? To Mount Washington in New Hampshire, which we had visited the previous day! 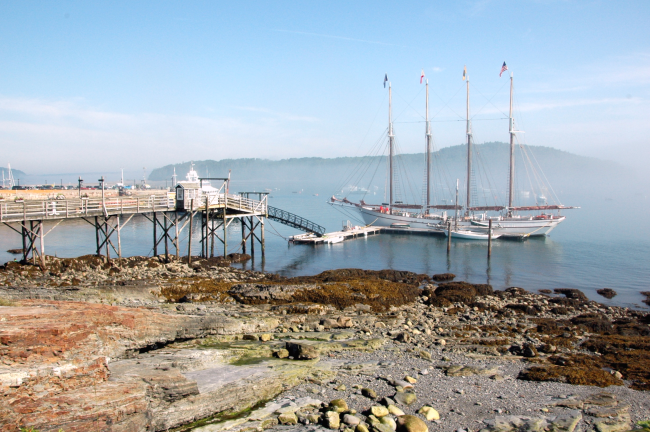 We had decided to spend Independence Day in Bar Harbor. 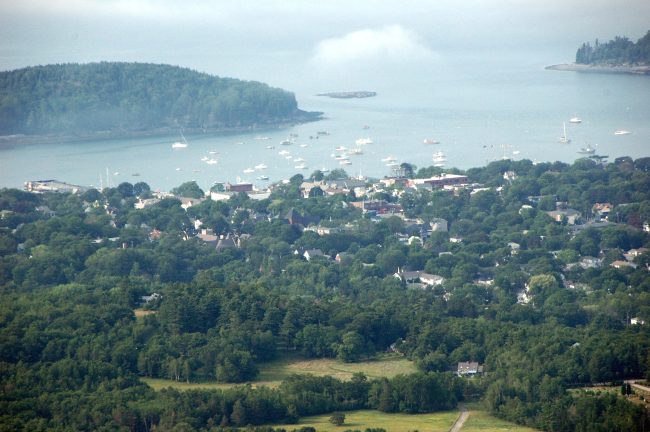 In addition to being a tourist center, in the late 19th century Bar Harbor was home to the rich and famous, who maintained luxurious estates with landscaped gardens. Among the town’s claim to fame is the fact that it is the birthplace of vice-president Nelson Rockefeller on July 8, 1908. The view on a walk along the Shore Path gives meaning to the native American name to the area, Pemetic – ‘range of mountains’ or ‘mountains seen at a distance’. The current name of the town comes from the sand and gravel bar, visible at low tide, at the rear of the harbour. The numerous ships – from large sailing ships to tiny boats – seemingly floating in the mist of the harbour render the view an ethereal quality. 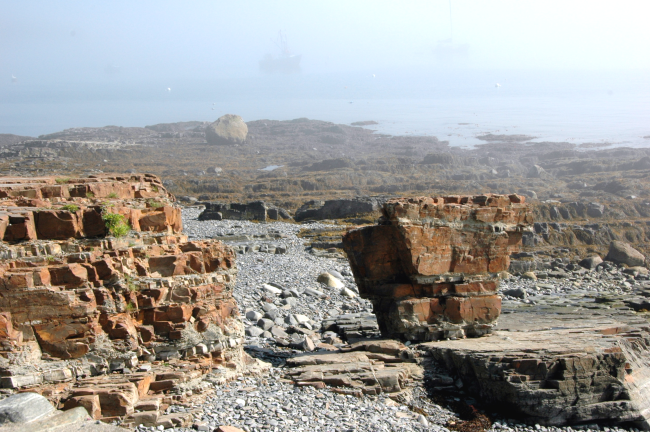 The coastline of Maine in this area is extremely rocky. You will see very many interesting rock formations around here. 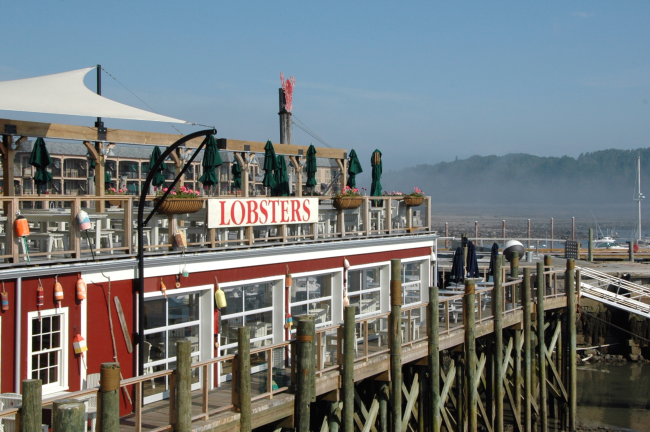 We had dinner at a lovely place in downtown Bar Harbor. Though the waterside walk was crowded with people out to watch the fireworks, the weather was great and the walk very pleasant. Another encounter with the lobsters for a July 4th dinner… watching fireworks over the bay. A perfect end to a perfect trip! Hey I’ve been exactly here two summers ago on 4th of July!